Styes in your eyes? Keeping the eyes clean and resist the urge to rub, even during allergy season. This can go a long way toward avoiding these troublesome bumps. Do you sometimes get tender, red bumps at the edge of your eyelids? Those are probably styes. You can take steps to avoid them and in most cases, you can treat them yourself, too. What causes a stye on your eye? A stye is an infection in an eyelash follicle or tear gland. If you introduce trauma (scratching) or bacteria to the area, the follicle or gland sometimes gets blocked and infected, according to family physician Michael Rabovsky, MD, Chair of Department of Family Medicine. Styes typically occur on the outside edge or just under the eyelid. They are bumps that look like pimples, surrounded by redness. They usually last about three days, pop and then heal in about a week. What’s the best way to avoid styes? Wash makeup off before bedtime so eye follicles don’t get plugged overnight. Replace eye makeup about every six months to avoid bacterial growth. Wash your hands regularly when using contact lenses. If you have allergies, don’t rub your eyes. Styes often look like pimples — making it tempting to squeeze them — but don’t do it. The stye will heal after it drains, but you should let it do so on its own time, Dr. Rabovsky says. You can help the process along by placing a warm, clean, damp cloth on the affected eye for five to 15 minutes a few times a day. Folding up a damp washcloth and microwaving it for a 10-20 seconds can work well. Just be careful the cloth doesn’t get too hot to use on your eyes. It’s convenient as a warm compress because as any edge of the washcloth gets to cool, you can refold for a warmer side. Over-the-counter ointments and solutions are also available to treat styes, but Dr. Rabovsky recommends a tried-and-true, inexpensive option for his patients: Wash the eye gently with baby shampoo so it doesn’t burn your eye. Also, to avoid further irritation, don’t wear makeup or contacts when you have a stye. How do you know you need more treatment? If the infection spreads, your doctor may prescribe oral antibiotics or antibiotic drops. Could those bumps be something else? 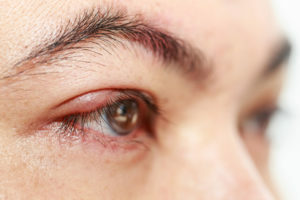 Unusual bumps on the eyes that aren’t red or painful are likely other harmless issues like chalazion (a firm lump in an oil gland in the eyelid) or fatty deposits known as xanthelasma. Like styes, chalazion usually go away by themselves; xanthelasma are not harmful, but are sometimes unsightly and a doctor can remove them. More rarely, skin cancer can sometimes cause bumps in the eye area. Styes are easily managed and are usually a mild annoyance rather than a major problem. But if they don’t go away or you have other unusual symptoms, talk to your doctor.